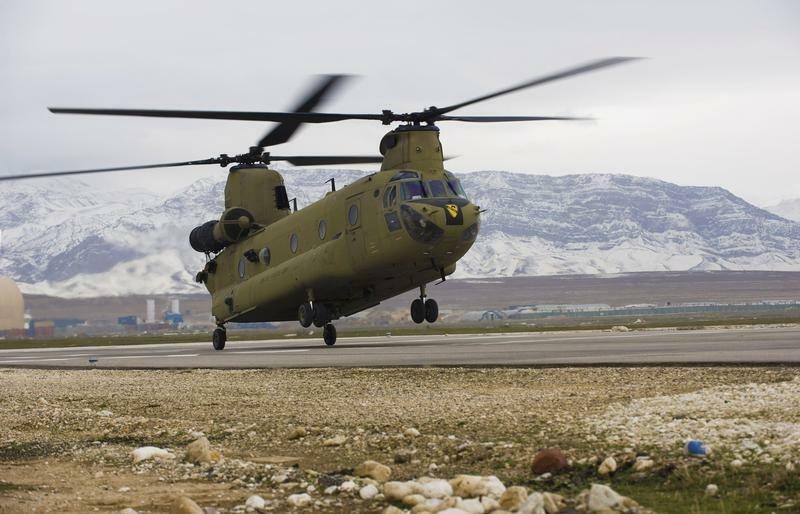 WASHINGTON (Reuters) - Boeing Co (BA.N) on Monday said it expects to sell 150 more of its popular CH-47F Chinook helicopters to foreign countries through 2022, with the helicopter drawing strong interest from new countries outside the 19 nations that already operate it. Steve Parker, Boeing's vice president for cargo helicopters, told Reuters that Boeing expected a number of buyers from Europe, the Middle East and Africa, including "quite a number of new additional countries." He declined to give further details. Germany is one of the countries looking at a possible purchase, U.S. Army Colonel Rob Barrie, project manager for cargo helicopters, told Reuters at the annual Association of the U.S. Army conference. Parker said there could be news before the end of the year about additional foreign orders for the twin-rotor heavy lift helicopters, through direct commercial sales and government-to-government foreign military sales. There are 30 remaining options in a five-year contract that ends in fiscal 2017 that can be used for foreign orders, Parker told reporters. He said some countries that already operate the helicopters could place additional orders to benefit from the lower pricing in the multi-year contract. There are 874 Chinooks in service around the world, Parker said, including about 100 CH-47 D-models, some of which could be upgraded to the current F-model used by the U.S. Army. Barrie said the Army would not order enough CH-47F helicopters to justify another multi-year contract until the latest Block 2 version was in full-rate production around 2024. He said, however, the Army was looking at bundling Army orders with potential foreign orders to drive down costs through an umbrella or block-buy contract with Boeing, which needs to produce about 24 orders a year to keep production economical. Boeing officials said one of the big selling points for the F-model of the helicopter was that it was cheaper to maintain and operate than earlier models. Parker said Boeing expected to continue producing the helicopters into the 2030s, and the Army was expected to continue operating them into the 2060s. Barrie said the Army's existing multi-year contract could run into trouble if Congress failed to pass a budget for the year, and relied on continuing resolutions that maintain funding at prior year levels. The contract calls for the Army to buy 39 CH-47Fs in fiscal 2016, which began Oct. 1, seven more than in fiscal 2015.